Here are a few pictures of the lovely Panteon Guadalajara a.k.a. 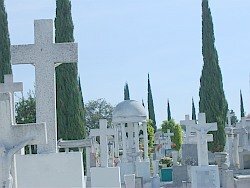 Guadalajara Cemetery that I thought you might like. 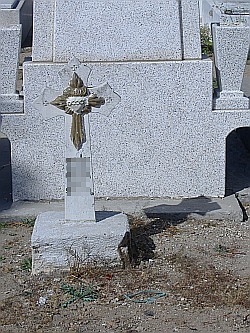 I've received a few comments like "What's up with the cemetery pics?" Some people might find it a little strange or morbid that I take these pictures. 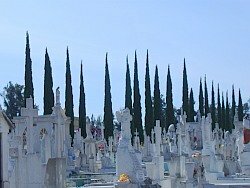 Call me crazy but I really love cemetery photos, especially these in Guadalajara because the tombs are so striking. 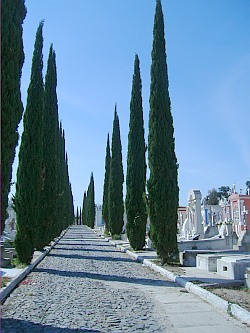 The Panteon Guadalajara is one of the newer cemeteries in Guadalajara, it is also known as Panteon Nuevo (New cemetery). I'm not quite sure when it was built so if anyone knows more of the history please let me know. While walking around this old cemetery we wondered if there were any scary stories or ghost sightings like at the Panteon de Belen, so we asked some of the groundskeepers. Who else would know besides them right? One of the older groundskeepers said he hadn't really heard of anything worth mentioning. I was a bit disappointed to hear that, however, he did confirm a very eery story we heard about a woman who "came back from the dead" in the Panteon Mezquitan many, many years ago. Stay tuned for more info. on that. You can check out some more pictures of the Panteon Mezquitan here. Return from the Panteon Guadalajara to See More Pictures of Guadalajara.